In this study, 284 food professionals including chefs and students of food science-related courses were surveyed to determine their level of business regarding allergens in foods and food safety in general were determined through questionnaire survey. A questionnaire comprising of 19 questions covering specific food safety issues and allergens in foods were used to collect information for the study through face to face interviews. Interviews were conducted for 284 people in Nigeria and Turkey. One hundred and ninety-five (68.7 %) of the respondents were from Turkey whereas 89 (31.3 %) were from Nigeria. Out of the 68.7% respondents from Turkey; 68.7% were students and 31.3% were chefs. The 31.3 % respondents from Nigeria were 33.7% students and 66.3% chefs. The result of the study indicated that the findings of scientific studies on food safety have not been directly applied by the people working in the food sector. Additionally, the knowledge level of the gastronomy and culinary arts students on food safety and allergens are higher than the restaurant chefs that prepare foods for the consumers. The restaurant as a significant part of the food chain industry must be well-prepared to face an increasing number of clients with food allergies. Burke, T., Young, I., Papadopoulos, A. (2016). Assessing food safety knowledge and preferred information sources among 19–29 year olds. Food Control, 69, 83-89. Food Standards Agency (2007). Consumer attitudes to food standards: Wave 8 UK Report Final. Available at: http://www.foodbase.org.uk/admintools/reportdocuments/441-1-777_cas2007ukreport.pdf (accessed 06.07.2017). Food Standards Agency (2013). Guidance on Advice on food allergen labeling Information. Available at: https://www.food.gov.uk/sites/default/files/multimedia/pdfs/publication/allergy-leaflet.pdf (accessed 28.03. 2017). Gong, S., Wang, X., Yang, Y., Bai, L. (2016). Knowledge of food safety and handling in households: A survey of food handlers in Mainland China. Food Control, 64, 45-53. Hassan, H. F., Dimassi, H. (2014). Food safety and handling knowledge and practices of Lebanese university students. Food Control, 40, 127-133. Hattersley, S., Ward, R., Baka, A., Crevel, R. W. (2014). 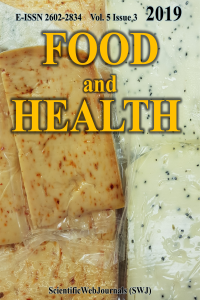 Advances in the risk management of unintended presence of allergenic foods in manufactured food products–An overview. Food and Chemical Toxicology, 67, 255-261. Jespersen, L., Griffiths, M., Maclaurin, T., Chapman, B., Wallace, C. A. (2016). Measurement of food safety culture using survey and maturity profiling tools. Food Control, 66, 174-182. Kabacık, M. (2013). Determınıng the food safety knowledge level of the kıtchen staff workıng for 4 and 5 star hotel kıtchens. Ordu Üniversitesi Sosyal Bilimler Araştırmaları Dergisi, 4(7), 112-127. Kunadu, A. P. H., Ofosu, D. B., Aboagye, E., Tano-Debrah, K. (2016). Food safety knowledge, attitudes and self-reported practices of food handlers in institutional foodservice in Accra, Ghana. Food Control, 69, 324-330. Kunadu, A. P. H., Ofosu, D. B., Aboagye, E., Tano-Debrah, K. (2016). Food safety knowledge, attitudes and self-reported practices of food handlers in institutional food service in Accra, Ghana. Food Control, 69, 324-330. Lee, Y. M., Xu, H. (2015). Food allergy knowledge, attitudes, and preparedness among restaurant managerial staff. Journal of Foodservice Business Research, 18(5), 454-469. Ovca, A., Jevšnik, M., Raspor, P. (2014). Food safety awareness, knowledge and practices among students in Slovenia. Food Control, 42, 144-151. Pratten, J., Towers, N. (2004). Food allergies and the UK catering industry: a study of the training needs for the industry to serve those with food allergies. Journal of European Industrial Training, 28(6), 490-498. Santich, B. (2004). The study of gastronomy and its relevance to hospitality education and training. International Journal of Hospitality Management, 23(1), 15-24. Smigic, N., Djekic, I., Martins, M. L., Rocha, A., Sidiropoulou, N., Kalogianni, E. P. (2016). The level of food safety knowledge in food establishments in three European countries. Food Control, 63, 187-194. Webb, M., Morancie, A. (2015). Food safety knowledge of foodservice workers at a university campus by education level, experience, and food safety training. Food Control, 50, 259-264. Woh, P. Y., Thong, K. L., Behnke, J. M., Lewis, J. W., Zain, S. N. M. (2016). Evaluation of basic knowledge on food safety and food handling practices amongst migrant food handlers in Peninsular Malaysia. Food Control, 70, 64-73. Zhang, Y., Zhu, L., Li, S., Zhang, J., She, T., Yan, J., Li, H. (2016). Identification of the major allergenic epitopes of Eriocheir sinensis roe hemocyanin: A novel tool for food allergy diagnoses. Molecular Immunology, 74, 125-132.